Yesterday I wrote about how astronomers can use the principle of parallax to measure the distance to stars. However this principle was first applied to the moon and the planets. More than 2,000 years ago Hipparchus used the parallax of the moon to measure its distance. He found that the distance to the moon was about 60 times the radius of the Earth, or about 237,000 miles. (The actual average distance is 239,000 miles.) Earlier, Aristarchus measured the angle between the Moon and the Sun when the Moon was in its quarter phase (when half of it is illuminated from the Sun), and used trigonometry to determine that the Sun was about 20 times further away than the Moon, or about 4,740,000 miles. This distance is much lower than its actual value, but was the accepted value until at least the 1400s. Despite their success with the Moon and the Sun, the distances to the planets were essentially unknown. It was known, for example that Mercury and Venus must be closer than the Sun, since they occasionally passed in front of (or transitted) the Sun. The other known planets, (Mars, Jupiter and Saturn) never transited the Sun, and so they must be farther away. But at the time astronomers didn’t have the necessary tools to measure planetary distances accurately. This was further complicated by the fact that until the 1500s it was generally thought that the Sun, Moon and planets moved around the Earth, which was fixed at the center of the universe. It was not until Copernicus published his heliocentric (sun-centered) view of the universe that astronomers could finally determine the size of our solar system. By the early 1600s, Johannes Kepler was able to demonstrate how the distances of the planets were directly related to the distance from the Earth to the Sun. Using precise measurements made by Tycho Brahe he devised three laws of planetary motion, which are now known as Kepler’s Laws. One of these laws stated that the period of a planet’s motion (how long it takes to orbit the Sun) is related to the semi-major axis of its orbit (essentially its average distance from the Sun). By determining a planet’s orbital period in Earth years, astronomers could easily calculate distance from the Sun as it relates the distance from the Earth to the Sun. This meant astronomers could define the distance from the Earth to the Sun as one astronomical unit (1 au). Thus, Venus was 0.72 au from the Sun, Jupiter was 5.2 au, Saturn was 9.5 au, and so on. But this only gave the proportional distance. To find the actual distances of the planets, astronomers needed an accurate measurement of 1 au. In Kepler’s time no one had such a measurement. Kepler thought the distance was at least three times greater than the distance measured by Aristarchus, but wasn’t able to make an accurate measurement. Then in 1769, astronomers finally had the opportunity to undertake an accurate measurement. In June of that year Venus would transit the Sun, and astronomers now had clocks and telescopes of sufficient accuracy. Several teams of astronomers were sent across the globe, including one to Tahiti by James Cook. The astronomer William Hirst wrote of his measurements of the transit in a letter to the Royal Society. 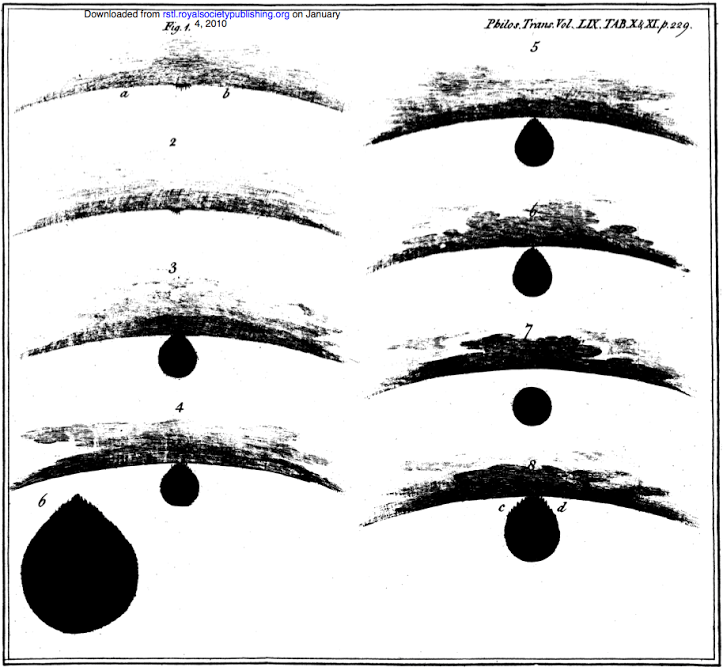 Hisrt’s observations were like those of many other astronomers, in that he measured the times at which the transit of Venus began and ended as seen from his location. By comparing his measurements with those of other astronomers, it was possible to determine the parallax of Venus, and therefore determine its distance. 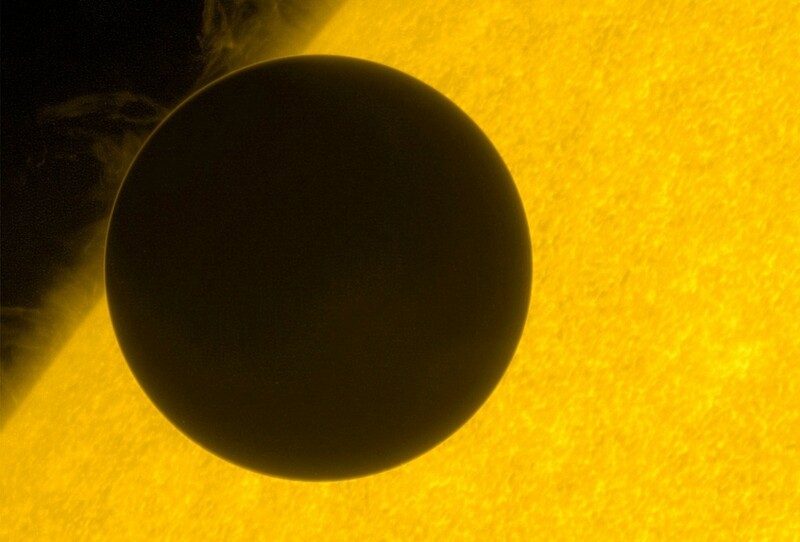 The exact timing of the transit was hampered by the fact that Venus would appear somewhat distorted when it was near the edge of the sun, which is known as the black drop effect. You can see this in Hirst’s sketches seen below. Still, by 1771 several different measurements were collected and analyzed. The result was that the distance Sun was 24,000 Earth radii, or about 95 million miles. This is slightly larger than the actual value of 93 million miles, but is significantly more accurate that of Aristarchus. Astronomers now had a reasonable measurement of the solar system. Planetary distances can now be measured with radio telemetry to an accuracy of 3 parts in a billion. It is accurate enough to observe it changing over time. The Sun gradually loses mass as it radiates energy, and so the orbits of the planets (including Earth) are slowly getting larger. Thus the astronomical unit is increasing by several meters per century. In 2012, the International Astronomical Union defined the astronomical unit as a fixed standard, which means the Earth’s distance is slowly getting larger than an astronomical unit. But thanks to a rare alignment of planets 250 years ago, we were able to learn for the first time just how large our solar system really is.